Studies have proven that children who eat breakfast do better at school as they are better able to concentrate and behave well. If it has this benefit for children, then it will do the same for adults. Breakfast helps to restore the levels of glucose which help with our brain function. This helps to improve memory, concentration and mood and also lowers stress levels. We all know that feeling of anger that rises up through being hungry. Breakfast can help us avoid this. The combination of a piece of fruit and trail mix creates a balanced breakfast, providing fiber and vitamins. What can be quicker than just putting nuts into a tupperware and grabbing a a piece of fruit on the way out the door (or eating them straight away)? Just doing this could make a big difference to your health. There are many instant porridge sachets around now – all you need to do is add water and microwave for a few minutes and then you have a healthy breakfast. Avoid the ones with added sugar and flavors, to keep the calories down but a plain version provides an easy breakfast virtually instantly. You can always add a scoop of frozen berries before microwaving to add in your own flavour. Go for natural plain Greek-style yogurt and add in fresh fruit, for a nutritious, quick and healthy breakfast on the run. Again, this only takes a minute or so to prepare and can make a big difference to your health and wellbeing. Fiber can bring health benefits and help you feel full so opting for a high fiber cereal will provide your body with a good start to the day. 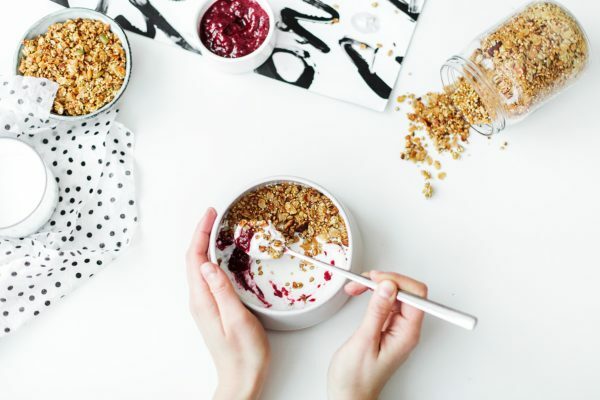 Make sure you avoid the traditional sugar filled cereals as these will increase your calorie intake while not necessarily helping provide what your body needs. Go instead for the more natural cereals and oats that have no processing for optimal nutrition. Check the ingredients list as well as the nutrition chart to make sure there’s no hidden sugar. Marketing is clever on cereal boxes…you need to out-smart them and look for the right info!